Moved by compassion, he [the Buddha] recited a divine spell and called together a local spirit and the Fearless Guards of Five Quarters to stand watch over the Five-Phases Mountain [fig. 1]. 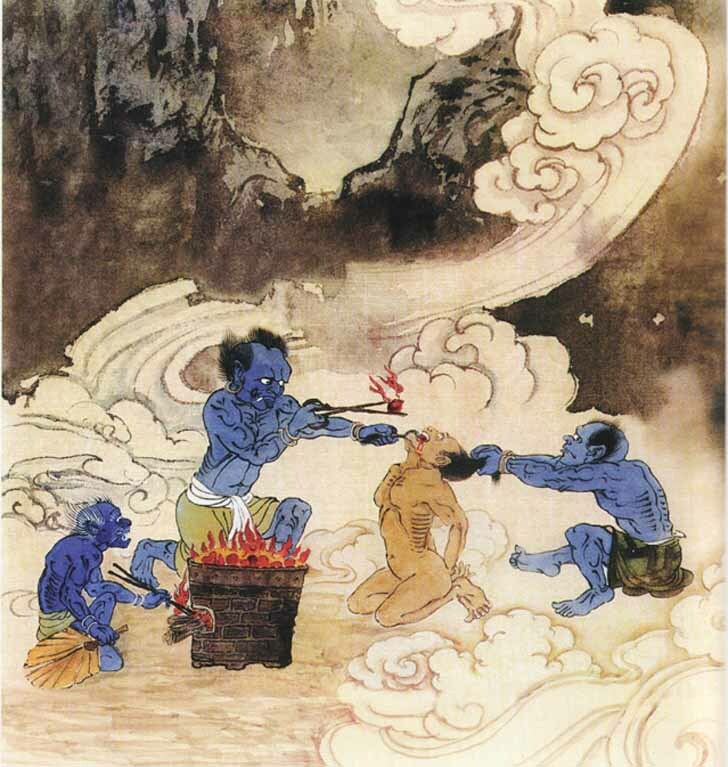 They were told to feed the prisoner [Monkey] with iron pellets [tie wanzi, 鐵丸子] when he was hungry and to give him melted copper [ronghua de tong zhi, 溶化的銅汁] to drink when he was thirsty. When the time of his chastisement was fulfilled, they were told, someone would be coming to deliver him (Wu & Yu, 2012, p. 199). Fig. 1 – One of the guards charged with watching over Monkey (larger version). 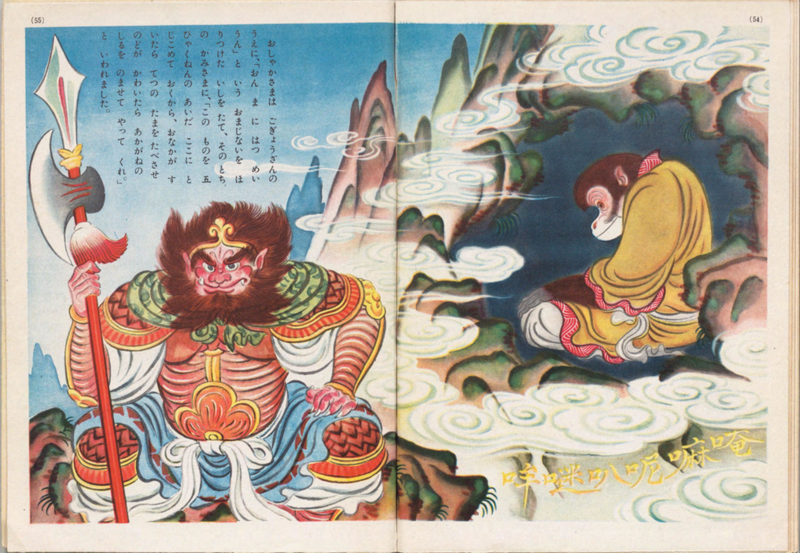 From the children’s book Son Goku (1939). […] Terrified they run out, seeking safety and refuge, but they arrive at the Hell of Hunger [Ji, 飢]. The wardens come to ask them: “Since you came here, what do you want?” They answer: “We are hungry”. The wardens then seize them and throw them on burning iron. They are caused to stretch and spread out their bodies; with iron hooks the wardens hook the sinners’ mouths and force them open; they put iron pellets into them [fig. 2]. The pellets burn their lips and tongues, from the throats down to their stomachs. The pellets penetrate through the sinners; there is nothing but burning. The horrible, fatal, and bitter suffering makes the sinners shriek and moan. Since their punishment is not yet completed, the sinners do not perish. After having suffered for a long time, they leave the Hell of Hunger. Frightened they run away, looking for relief and safety, until they arrive to the Hell of Thirst [Ke, 渴]. The wardens come to them and ask: “Since you came here, what do you want?” They answer: “We are thirsty.” The wardens thereupon seize the sinners and throw them on burning iron. They are caused to stretch and spread out their bodies; with hot iron hooks, the wardens hook the sinners’ mouths and force them open. They pour down molten copper [fig. 3]. It burns their mouth, lips and tongue; from their throats it reaches their stomachs. It penetrates down and goes through them; there is nothing but burning. The terrible, fatal, and bitter suffering makes the sinners shriek and moan. Since the remaining transgressions have not yet been atoned, they do not perish. After having been subjected to this punishment for a long time, they leave the Hell of Thirst (Howard, 1986, p. 131). Fig. 2 – A damned soul being force-fed red hot iron pellets (larger version); Fig. 3 – Souls being forced to drink molten copper (larger version). Images from the 20th-century. 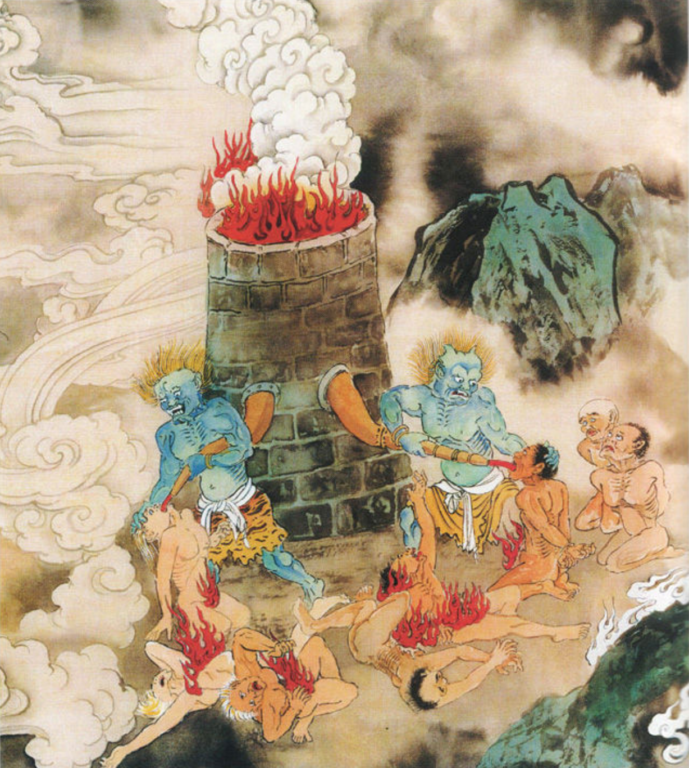 The same source explains the hells of hunger and thirst are the respective fourth and fifth of sixteen minor hells (xiao yu, 小獄) making up one of the eight greater purgatories (Da diyu, 大地獄) called the hell of Consciousness (xiang, 想). Sinners reborn into this labyrinth of pain are full of anger and lash out at each other with scythe-like claws and swords and daggers. They remain conscious through endless rounds of dismemberment and resurrection via a magical wind. They then wander into each successive minor hell, enduring everything from grinding by hot millstones to their flesh and bones being shattered by blistering cold. Again, each sinner remains conscious and resurrects between each purgatory (Howard, 1986, pp. 129-134). Another name for the greater hell of Consciousness is the Sanskrit term Samjiva (Ch: deng huo, 等活), meaning “revival” or “repetition”. These might refer to the cyclical resurrection of the sinner, or to their karmic punishment mirroring what they did to others in life (Robert & David, 2013, p. 754). It should be noted that, unlike the Judeo-Christian tradition, rebirth in the Buddhist hell is not forever. For some it may last eons, but the torture serves to cleanse the spirit of past sins gained in life. Once the karmic debt has been repaid, the soul will be reborn into one of the other six realms of existence (hell, hungry ghost, animal, human, asura, and deva). Sometimes souls have to work their way back up to human status if they have particularly heavy karmic baggage. Monkey’s punishment is essentially hell on earth. The Five Elements mountain pins him down so the chosen guards can torture him with hot iron pellets and molten copper just like those in the subterranean hells of hunger and thirst. He is not capable of dying, so his immortality serves a similar function to the magic wind that continually resurrects the damned. The finite length of his sentence (500 years) is similar to the way a soul will only stay in the hell realm until they have repaid their karmic debt. And Tripitaka delivering him from his torments is like a soul being reborn into a new life. After all, Monkey’s life drastically changes after his release; he goes from being a rebellious, power-hungry demon, to a Buddhist monk devoted to the protection of his master. Buddha said to the bhiksus: “South of Jambudvipa, in the interior of the great Diamond Mountain, lies the palace of King Yama. The realm he governs extends for six thousand yojanas in both directions. His city has seven rows of ramparts, with seven nets and seven rows of trees … Day and night, three times a day, a huge copper cauldron automatically places itself in front of him. If the huge cauldron emerges in the interior of the palace, the king, upon seeing it, rushes out of the palace stricken by horror and fright. But then, if the cauldron emerges outside the palace, the king, upon seeing it, reenters the palace stricken by horror and fright. Giant hell wardens grab King Yama and have him lie down on hot irons. With iron hooks, they split his mouth open and force molten copper down. It burns his lips and tongue; from the throat, it reaches his stomach. It spreads down below and passes through [his body] so that no place is left unburnt. The punishment continues [in this fashion] until its completion. Afterwards, King Yama returns to seek amusement with all his ladies. Many great state[s]men, who possessed riches, are also punished in this way” (Howard, 1986, p. 141). So Yama inhabits an odd position where he is both a member of the heavenly hierarchy working to judge the fate of the dead and a damned soul repaying a karmic debt through torture. Howard, A. F. (1986). The imagery of the Cosmological Buddha. Leiden: E.J. Brill.